In the past, IG Metall has held massive strikes to force automakers to boost wages. 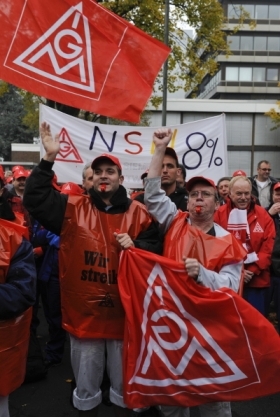 MUNICH - The union representing German autoworkers, IG Metall, says it will put maintaining jobs ahead of pay increases in upcoming wage negotiations in the metal and electrical sector. "The amount of our wage demands depends on whether we successfully reach an agreement on measures to safeguard employment," said Matthias Jena of IG Metall Bavaria. IG Metall's current collective pay agreement with employers runs out on April 30. Unlike previous years, the union will not be making vociferous demands for pay increases due to the dismal economic situation. In 2008, the union asked for an 8 percent pay increase and won 4.2 percent. The first exploratory talks are already taking place with employers in all IG Metall districts throughout Germany. A collective bargaining agreement through 2011 is being discussed. IG Metall is considering expanding a current agreement that allows employers to reduce working hours from 35 to 30 during a crisis without compensating workers for the loss of income. The expansion of this contract would allow companies to cut working hours to save jobs.